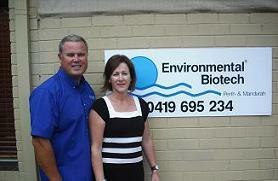 Environmental Biotech has been in business in Australia for 20 years and has franchisees operating in New South Wales, Queensland, Victoria & Western Australia. We have been fortunate to work with a number of leading companies, restaurants, supermarkets, shopping and entertainment centres to name a few. Environmental Biotech offers unique and effective solutions to drain line and odour problems commonly found in commercial and industrial establishments. Our service combines both a biweekly proactive service that focuses on eliminating the source of the problem and a 24-hour reactive service that is always there for our clients should they experience unexpected problems. 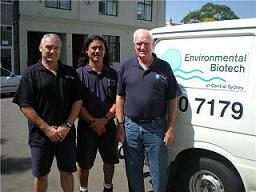 In other words, we are a one-stop shop for all your commercial drain line and odour problems. Bioremediation is the 'treatment of pollutants or waste (as in an oil spill, contaminated ground water, or industrial process) by the use of micro-organisms (as bacteria) that break down the undesirable substances'. Environmental Biotech has dedicated hundreds of thousands of dollars to isolating and training various strains of bacteria. These bacteria specialise in bioremediating grease and oil (lipid), sugar, starch and gelatine problems produced by commercial establishments. All research and development, production, blending and packaging is undertaken exclusively in our laboratories by Environmental Biotech employees. 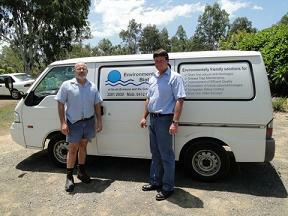 The solution is Environmental Biotech's scientifically developed system of proactive drain line management. 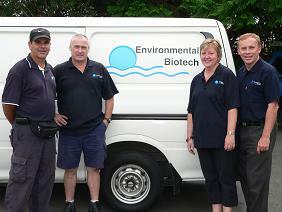 We use natural bacteria to bioremediate these harmful wastes into harmless by-products mainly water. Our highly effective, scientifically proven systems can greatly reduce and in some cases eliminate drain line and odour problems, saving our clients money, time and headaches. Our solutions help both their bottom line and the environment. That is why we are called "the Drain and Odour Experts".